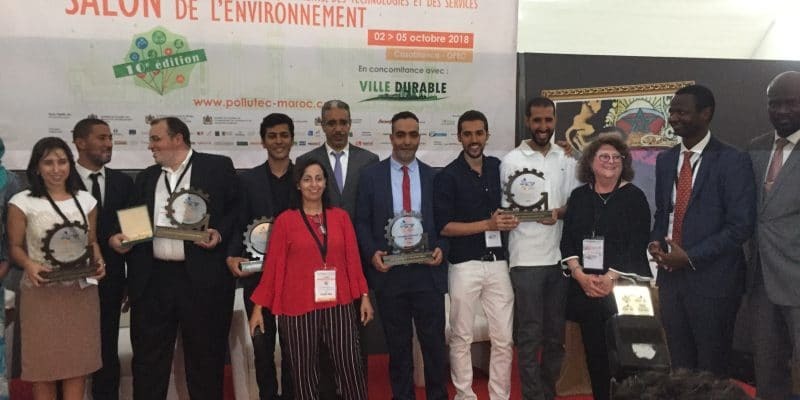 On the occasion of Pollutec Maroc 2018, several startups and SMEs were rewarded on the opening day of the show, as part of the Cleantech Programme and the Pollutec Maroc Trophies. The opportunity to discover all the ingenuity of young Moroccan eco-entrepreneurs and more experienced SMEs, with the Pollutec Maroc Trophies. Head of Government Saad Eddine El Othmani presided over the inauguration ceremony of the 10th edition of Pollutec Maroc 2018 on Tuesday, October 2, 2018. Organised under the High Patronage of King Mohammed VI, the event welcomes some 190 exhibitors from 14 countries to Casablanca to present the latest innovations and technologies in the field of environment: waste sorting and recovery, drinking water, wastewater treatment, air quality…. The Global Cleantech Innovation Programme (GCIP)/Morocco Grand Prize, also 1st prize in the “Renewable Energies” category, was awarded to Farasha Systems, which offers direct detection solutions for failures affecting certain infrastructures, and in particular photovoltaic solar power plants, using thermal and visual cameras on board air drones or land vehicles. A technique that reduces costs and increases maintenance efficiency to optimize the efficiency of solar panels. Saloua Alami (Athisa), Julie Pelletier (Ecomesure) and Habib Merabet (DBO Expert Maroc) and Aïcha Saadi (Mairav) receive the Pollutec Maroc Trophies from the organisers. The story is pretty since Abderahman Kriouile, CEO and founder of Farasha Sytems, was trained in France, at Inria and at STMicroelectronics, where he began to develop his process. He finally decided to return to Morocco and continue his research at the Higher National School of Computer Science and Analysis in Rabat. He was able to successfully test his system on the huge Noor solar power plant in Ouarzazate. The prize for rational water use was awarded to Watec, a company that installs wastewater treatment plants for rural municipalities and decentralised sites. The waste recovery prize was awarded to Eco-Oil, which offers solutions to re-transform recyclable and non-recyclable plastic waste into oil… The green building award was given to Eco-Dome, which wants to offer affordable and ecological building structures. The energy efficiency prize was awarded to M4Nature, which produces natural products and ingredients based on plants from Moroccan soils. Finally, the prize for women entrepreneurs was awarded to Project Gems, which offers an irrigation system based on nanotechnology. Sylvie Fourn, curator of the Pollutec Maroc exhibition, also seized the opportunity of the exhibition’s opening hours to present prizes. 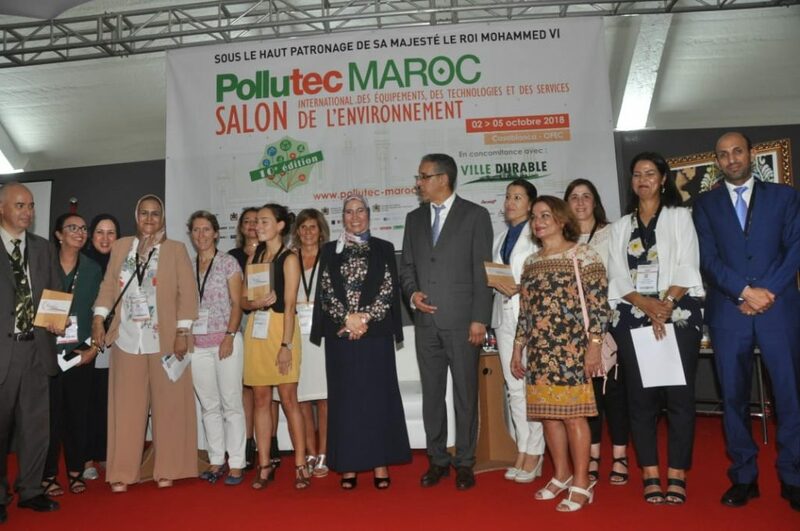 It is the 4th edition of the Pollutec Morocco Environment Trophies, which reward the most outstanding products, services and achievements of the exhibitors and co-exhibitors of the show. Gold was awarded in the “Exemplary Achievement” category to Athisa for the establishment of a medical and pharmaceutical waste management and treatment unit using Mimo technology. The money came back, in the “Innovation” category, to Écomesure for connected, multi-parameter stations with continuous, real-time measurement of air quality. The Bronze Trophy was awarded to DBO Expert Maroc, for the Enviro-septic domestic wastewater treatment plant, which would not need energy or chemicals, would not produce sludge, noise or odours and would not require any maintenance… To be continued in any case.